Sunday May 14th 1899 Oh what a cheerless day. just one cold dreary rain after another. I read wrote and rested all the time I had to spare from the work. The two last weeks has been very hard for me. Monday May 15th 1899 There was an awful hard rain for three hours last night with terrible thunder & lightning. I was at work all the forenoon fixing up my hens nests after the rain. In the afternoon Ada came and we went up to Aunt Libs. Did evening work. Will went to town with John Mc.- in the afternoon. he had a cow killed by lightning Tuesday May 16th 1899 I was busy about the work most of the forenoon. I was down to Callies in the afternoon. Will James and wife called just at supper time. Weather warmer. 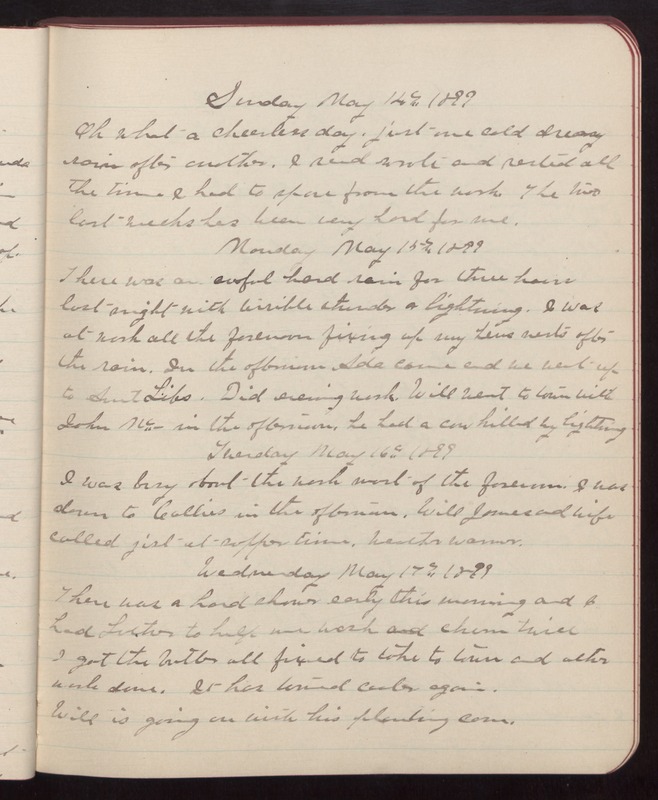 Wednesday May 17th 1899 There was a hard shower early this morning and I had Luther to help me work and churn twice I got the butter all fixed to take to town and other work done. It has turned cooler again. Will is going on with his planting corn.